This Spring’s featured ingredients is the incredible edible Egg. Eggs are produced by most birds, reptiles, insects, mollusks, fish, and monotremes like the platypus. Eggs laid out of water are surrounded by a protective shell. If an egg is fertilized, an animal embryo grows within the egg white, and is nourished by the yolk. Tiny pores in bird eggshells allow the embryo to breath. When developed the baby hatches, emerging from the egg. Commercial eggs we eat are mainly unfertilized. Most eggs are oval shaped. While still inside the mother, the egg shell is still malleable. As her oviduct muscles contract behind the egg to push it forward, a pointy end develops in the back. Cliff dwelling birds often have highly conical eggs, while eggs from birds nesting in holes are nearly spherical. This trait is believed to have developed through natural selection. One of the most unique appearing eggs is the bullhead shark’s, which is shaped like a cork-screw. The largest egg is from the ostrich, which can weight up to 3 pounds (~1.4 kg). The tiny bee hummingbird produces the smallest egg at half a gram, weighing less than a paper clip! Eggs naturally come in a variety of colors including white, yellow, brown, pink, green, blue and speckled. Many animals enjoy eating delicious eggs, including foxes, racoons, weasels, sea otters, seagulls, ravens, snakes, and humans. Humans mainly eat chicken eggs. Duck, quail and fish eggs are also commonly eaten. Eggs can be enjoyed poached, boiled, fried, pickled, salted, fermented and raw. Unpasteurized raw eggs are not recommended by the USDA for the immunocompromised, including children, pregnant women and elderly due to the risk of salmonella bacteria poisoning. As an egg ages, an air bubble between the egg white and the shell grows larger. A “bad egg” will float in a bowl of water. In Chinese cuisine, fermented “century eggs” are made by coating raw eggs in a clay mixture and allowing them to cure for several weeks. The yolk turns green and whites brown with an ammonia smell, and jelly texture. Eggs are part of cultural traditions around the world, especially during the spring equinox. Eggs generally represent fertility and new life. The Easter bunny is said to have arrived in the United States with German immigrants in the 18th century. Children were told only good girls and boys would receive colored eggs in the nests they made in their caps and bonnets on Easter morning. German immigrants also carried their Easter celebration with them to Sweden. The Swedish word for Easter bunny, Påskharen, sounds very similar to that for the Easter wizard, Påskkarlen. The Easter wizard is said to have been more conducive to the pagan traditions of Sweden, where today children still dress as witches for Easter. The Middle Eastern spring equinox New Year celebration Norouz is enjoyed by peoples of many different ethnicities and faiths. The tradition originated in Persia and was carried with its immigrants to surrounding countries. During Norouz, each family member decorates a hard-boiled egg and sets them together in a bowl. A Haft Chin table is set with seven items: a mirror (symbolizing the sky), an apple (earth), candles (fire), rose water (water), sprouted wheat (plants), goldfish (animals), and the painted eggs (humans & fertility). 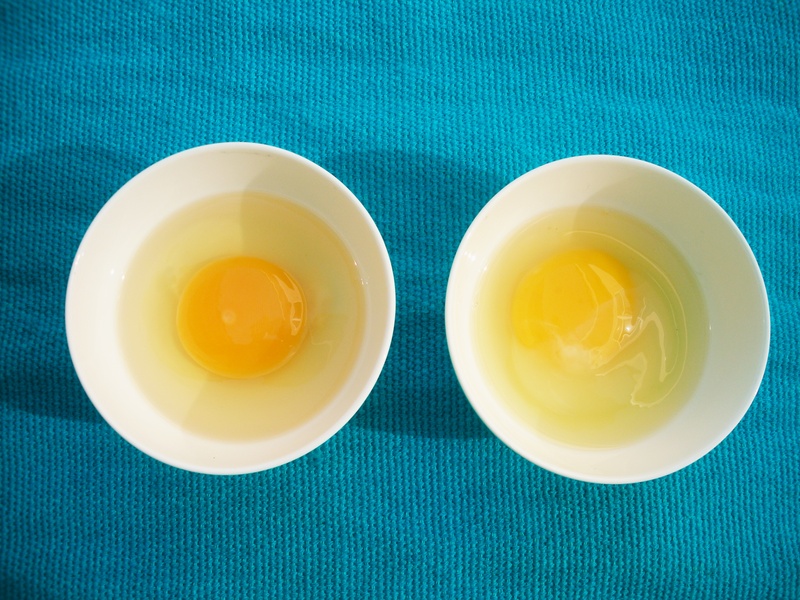 In Traditional Chinese Medicine (TCM), egg yolks are used in herbal decoctions to nourish yin, treating insomnia, irritability, anxiety, and seizures. Vaccines for infectious diseases are commonly produced in fertile chicken eggs. Diseases for which vaccines have been produced in chicken eggs include influenza, chicken pox, yellow fever, and Rocky mountain spotted fever. Eggs have numerous scientific properties, utilized in the kitchen. Heating an egg causes the individual bundled proteins to bump into one another, unfurling, and rebonding to each other. This interconnected matrix of proteins is what gives cooked eggs strength, with an increasingly rubbery texture. 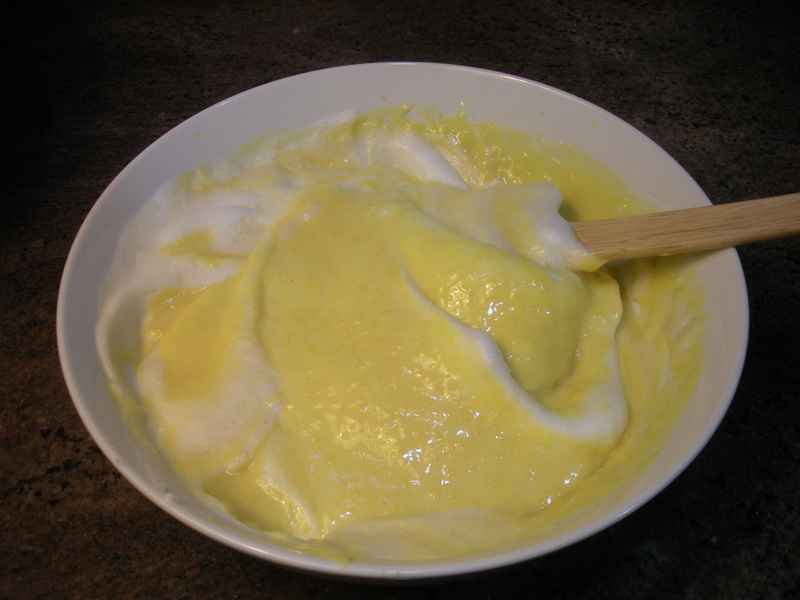 Beating a raw egg white incorporates air into the water and protein solution, unfurling the proteins and creating the matrix that holds the air bubbles within. Heat expands the air bubbles (as when baking a souffle) and then causes the matrix to harden so it does not collapse. Like many foods, eggs have gone from being called a “super food” to “junk food,” being linked to heart disease. This hypothesis grew out of eggs’ high cholesterol content. Recent research, however, indicates dietary cholesterol is not the root cause of heart disease. Consuming excessive amounts of protein without sufficient folate from plant-based foods, as well as highly refined oils and transfats, may be more directly related. Eggs whites are high in complete protein, and yolks high in choline and vitamins A, D & E. Pastured, free-range egg yolks can be higher in these nutrients, contain heart healthy omega 3s, signified by their darker, orange color. Pastured eggs are commonly available at farmers markets, and in local health food stores. When we eat a balanced diet based on the Healthy Plate Model, including eggs in moderation, high in vegetables & fruit, it believed to have a cardio-protective effect. 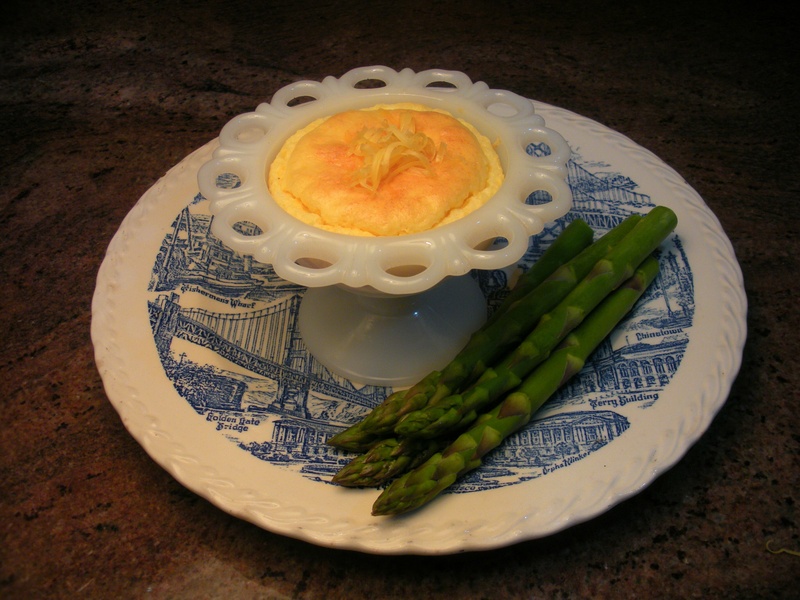 A souffle showcases eggs’ numerous scientific properties in one delicious dish. Rich cheddar cheese and yolk are balanced by the light cloud-like texture of the whipped whites. 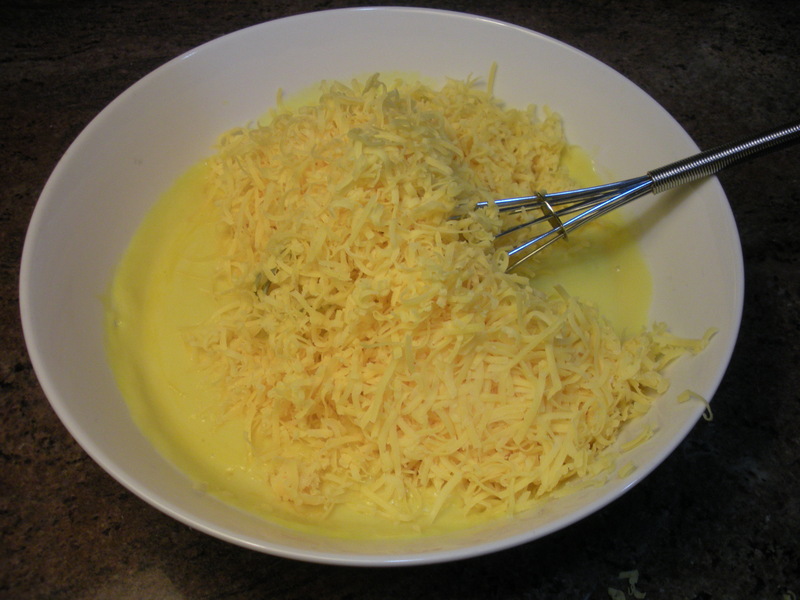 Freshly grated Swiss, Gouda, Fontina, Jack or Muenster cheese can be substituted for cheddar. Diced green chilies, ham, sauteed onions, or minced garlic can be folded in just before baking. 2. 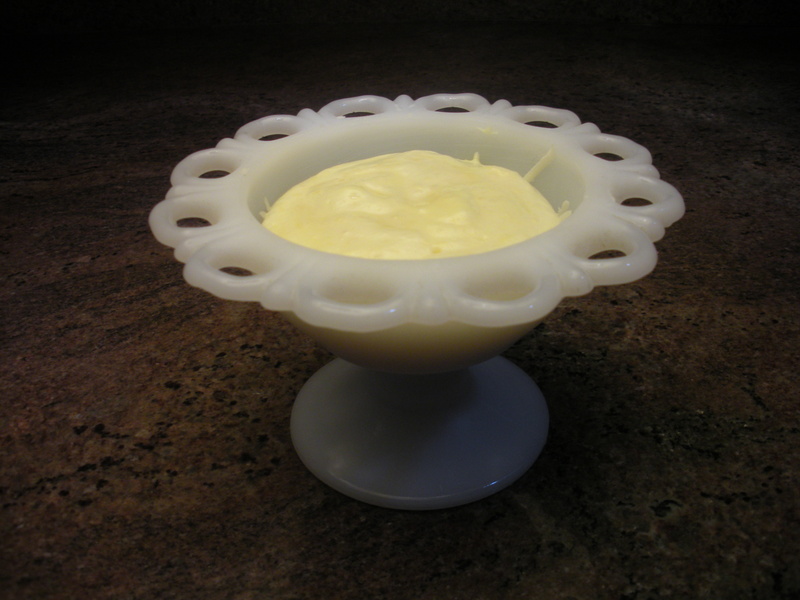 Butter the souffle ramekins. Divide the parmesan between the dishes, and cover their sides. Place in the freezer while preparing the souffle batter. 3. 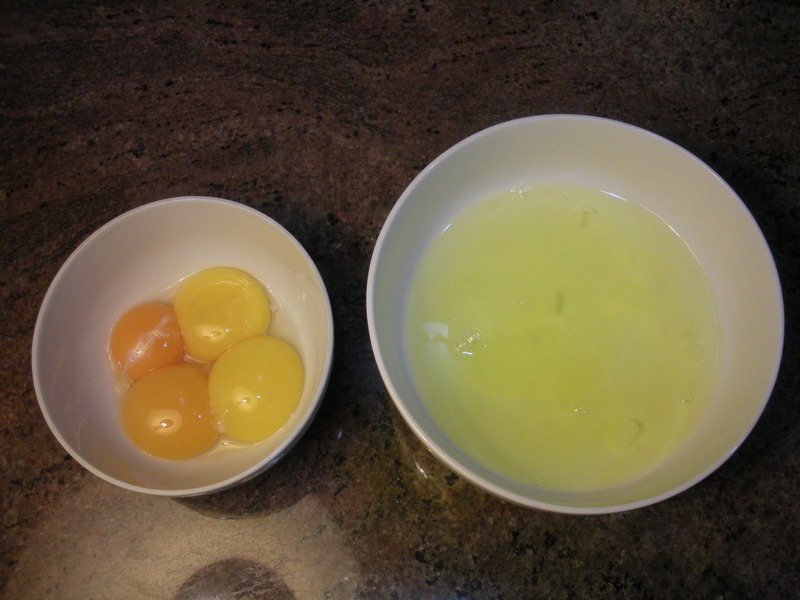 Separate eggs into 2 small bowls with 4 egg yolks in one, 5 whites in the other with one Tablespoon water. 4. In third small bowl combine the flour, dry mustard, garlic powder, and salt. 5. 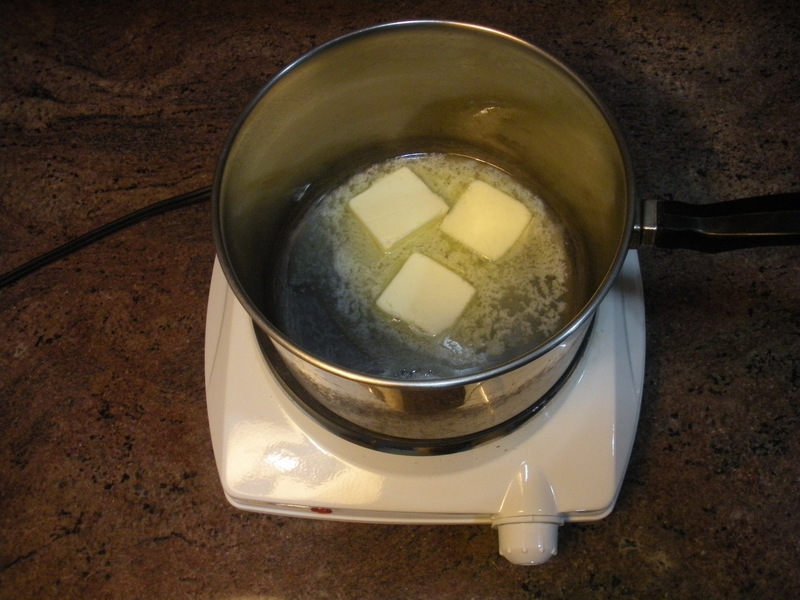 In one saucepan, heat the butter. Cook out water, being careful not to burn. 6. 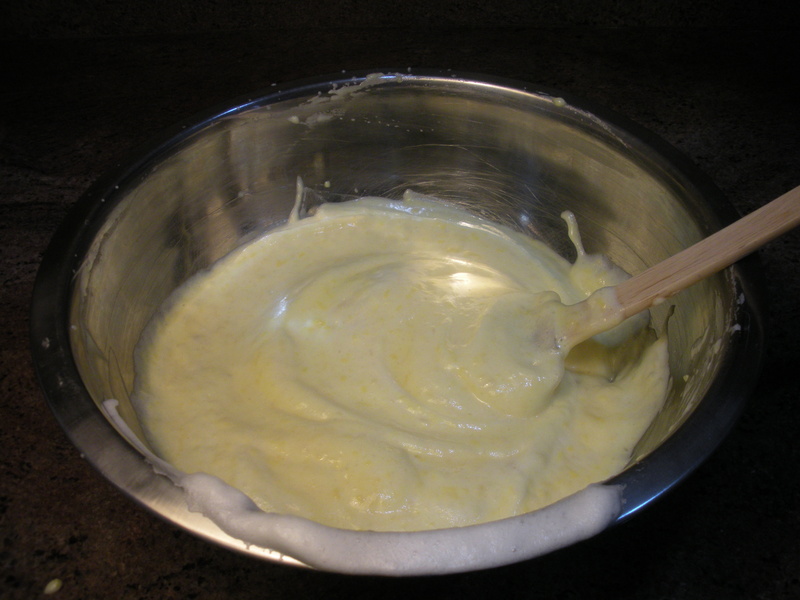 Whisk flour mixture into the butter. Cook for 2 minutes. 7. 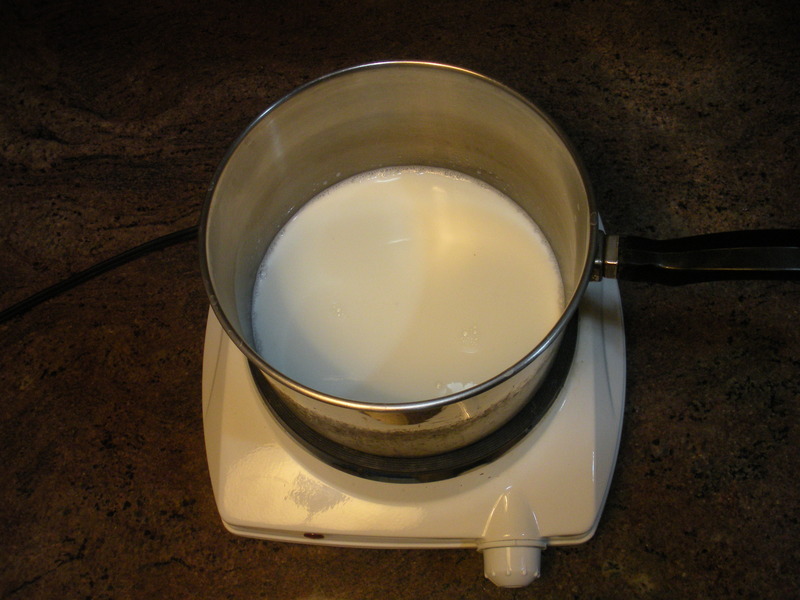 While heating butter, also heat the milk almost to a boil. 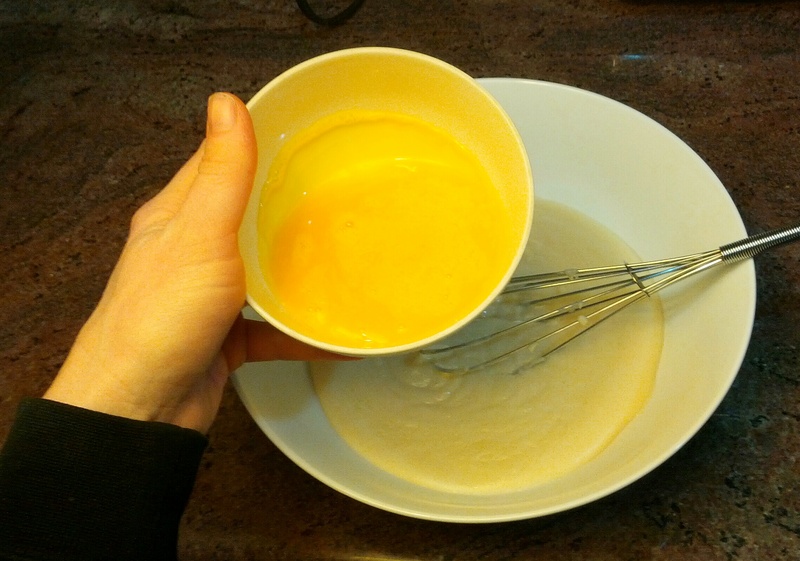 Whisk the hot milk into the butter flour mixture, and turn the heat to high. 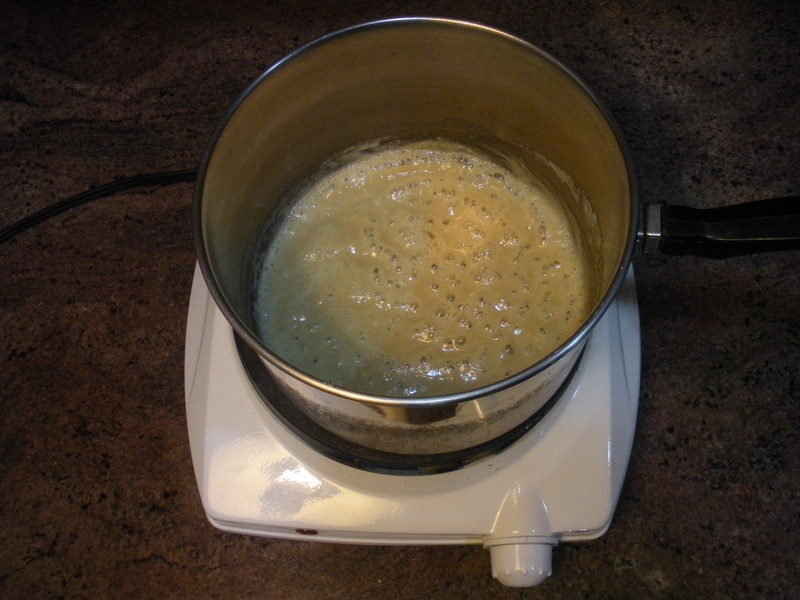 Once the mixture reaches a boil, remove from the heat. 8. Beat the egg yolks to a creamy consistency. 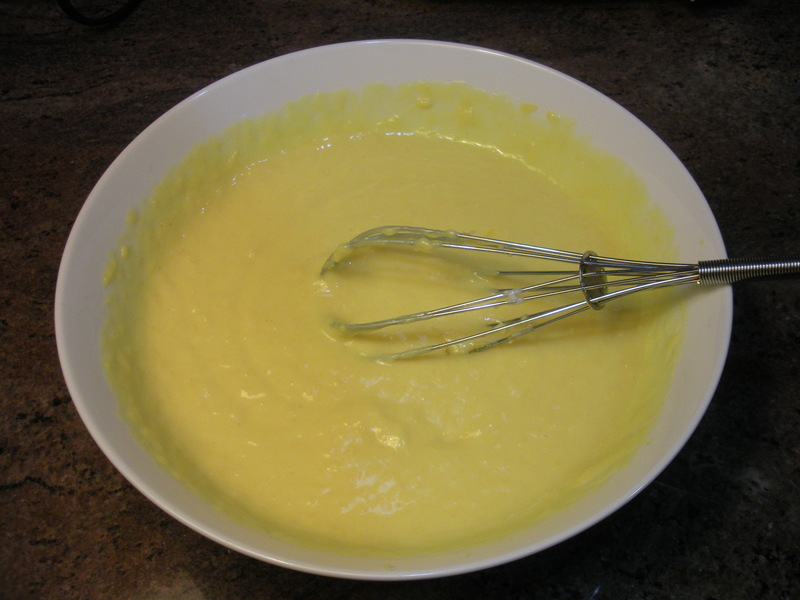 Temper the yolks into the milk mixture, pouring in a thin stream into the milk, constantly whisking. Remove from the heat and add the cheese. Whisk until incorporated. Cover. 9. 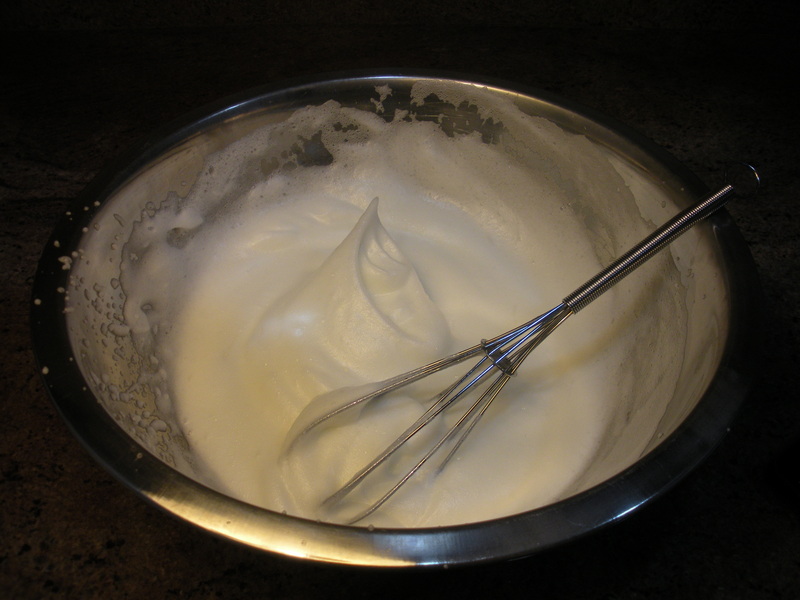 In the second large bowl, whisk the egg whites and cream of tartar until glossy and hold peaks. Add 1/4 of the whites mixture to the cheese mixture. Continue to add the whites by thirds, folding very gently. 10. Place ramekins on a baking sheet. Divide the souffle batter between the ramekins with spoon, filling to 1/2-inch from the top. 11. Bake in the oven ~30 minutes, until golden, puffed, and just set in the center. 12. 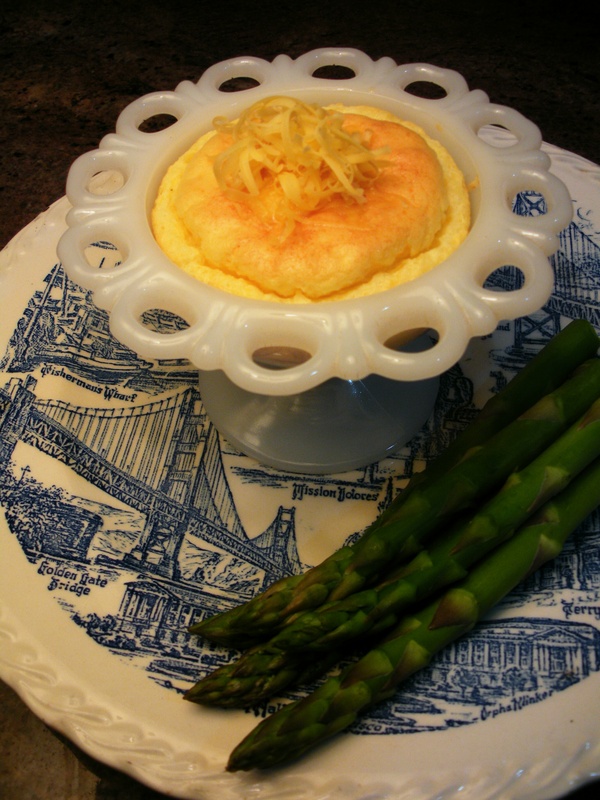 Using an oven mitt or towel, transfer the souffle ramekins to individual plates. Serve immediately with one’s favorite lightly steamed vegetable or a green salad.